My spouse took this photo. I think it rocks. He does, too. I have a confession to make: I don't get bananas in my farm share here in Ohio. I know I started this blog to share how I use seasonal produce--usually from our CSA farm share--to feed the family year 'round. Sometimes, however, I get good deals on produce that is not part of any farm share I've ever known. Like 49 cent pints of blueberries in July. Or speckled bananas for 27 cents a pound. Because I'm feeding my family from this seasonal abundance, I like to blog about it, too. There, I'm glad I got that off my chest. My CSA farm share will be starting up next week, so I'll be sharing more and more farm share recipes in the coming months. But this is too good not to share. I think bananas are one of nature's perfect foods. We planted a banana tree behind our home in Hawaii, and it grew fast and furious despite neglected soil. 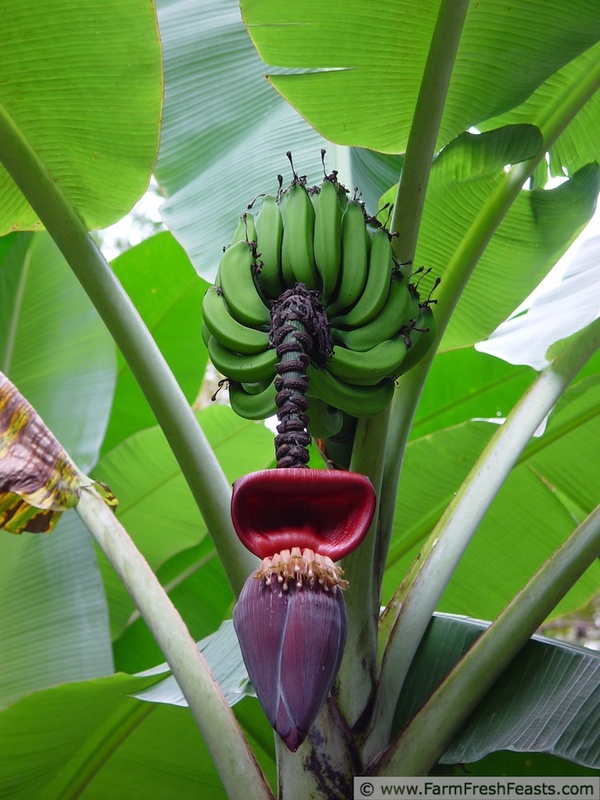 Then it flowered a gigantic flower and soon baby bananas appeared. We never ate any bananas from that tree--apparently someone else was watching the growth and development of our banana bunches as well, because once they got about big enough to harvest, the stem would disappear without a trace. I guess someone else needed them more than we did. Just like the local fauna appear to need the blueberries and peaches and strawberries in our backyard here . . . though we managed to snag 13 raspberries last year. I love that bananas don't fully ripen until after you cut them off the tree. Not like all the basil threatening to go to seed when you're not ready to make pesto, or the zucchini growing from 4 inches to 18 inches when you turned your back to weed the tomato bed. When I get a good deal on speckled bananas, I save some on the counter for immediate use and freeze the rest. And just how easy is it to freeze a banana? Carefully pick it up by the stem, open your freezer, and set it inside. Then carefully close the freezer--you're done! Sure, the skin turns dark brown on a frozen banana, but that same skin did a rockin' awesome job protecting the fruit inside while it was on the tree and that protection continues in your freezer. I usually set a frozen banana on the counter for 15-20 minutes before easily scraping off the peel with a paring knife. Forgetting about the banana for an hour means you can just cut off one tip and squish the banana into whatever you're preparing. Yum, that's a lovely image. Now that you've snagged bananas when they are perfectly good for baking and cheaper, and stored them properly until you're ready to use them, let's make a muffin. 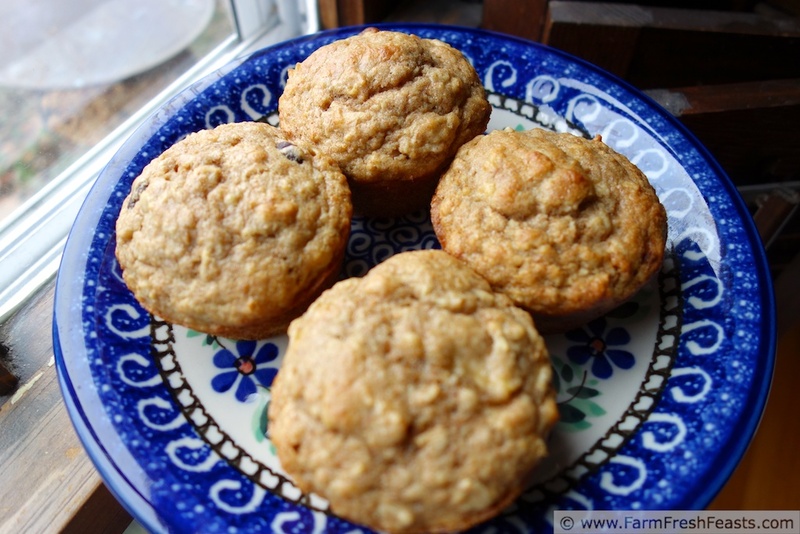 This recipe is a variation of my favorite soaked oatmeal muffin. It's best to start it the night before, but letting the oats and buttermilk soak for just an hour is nearly as good. See NOTE below. In a large bowl, mix oats and buttermilk. Set aside for at least an hour, up to overnight. NOTE: If you prefer, you can combine the oats and buttermilk in glass jars in the fridge whenever you've got a minute, and use them later when you have time. I've set up 3 jars for 3 batches of muffins and used them over the course of 5 days with great results. When you're ready to bake, preheat the oven to 400 degrees Fahrenheit and spray a standard 12 hole muffin pan or 24 hole mini-muffin pan with oil (or line with cupcake papers). Add squished banana, egg, vanilla, brown sugar and oil to the bowl. Mix thoroughly. Dump dry ingredients on top and mix until nearly combined, then add chocolate chips and mix until just barely combined. Scoop** batter into prepared pan. You should get 12 standard size muffins or 36 mini-muffins. Bake 15-18 minutes for standard size, 12-15 minutes for the mini-muffins. Cool in pan 5 minutes, then finish cooling on a rack. This post is hanging out with the Clever Chicks Blog Hop, the Wednesday Fresh Foods Link Up, What's Cookin' Wednesday at Buns In My Oven, What's In The Box at In Her Chucks, Foodie Friends Friday, Food on Friday and the brand new From The Farm Blog Hop. I love that picture of the bananas! And I'm slightly jealous that your CSA starts up so soon. Ours won't resume until June sometime... I can't wait! 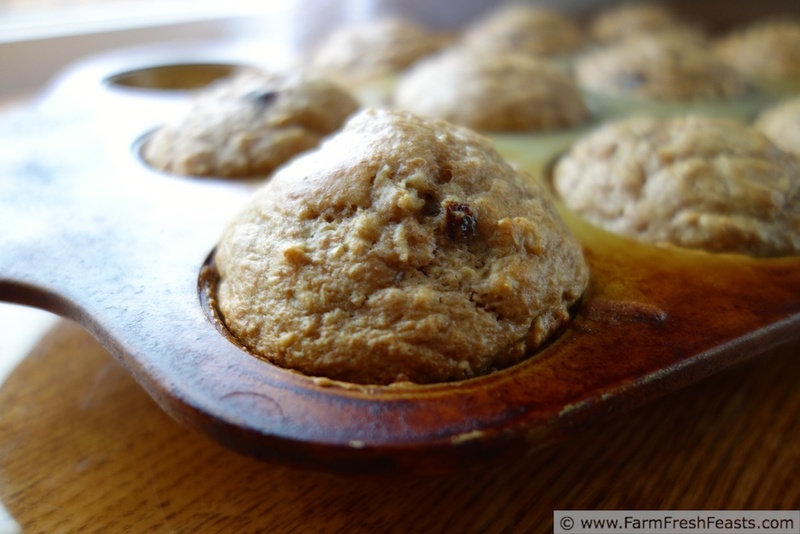 Keeping these muffins in mind for the next time I have mushy bananas! I spoke too soon! With all the cool wet weather we've been having here, our CSA is delaying the start by 2 weeks, until the end of the month. Just means that the season will be extended 2 weeks, and honestly I'm happier to have 2 more weeks of late Summer/Fall crops than 2 weeks of Spring crops! Last year we got tomatoes into November! It's happening in other places--our old CSA in Virginia is doing the same thing. I still can't wait though. Bananas really are a perfect food. So is tuna (love it canned, raw, or steaks) and a few other things. Yes, great photo. And you can blog about anything you want. we all evolve in our blogging. I want one of those muffins. I do feel like I am evolving--I have so much to write about I need time to sit and write! First it was company, then it was photography, now it's spending time with my spouse. I have fantasies of being able to just sit and write all the words inside my head (thank goodness the recipes are on scraps of paper and the photos are in the computer) after life settles down. But I remain committed to a blog encouraging folks to make the most of their CSA farm share, so that remains my primary focus. Yum, yum, yum! Oats, bananas and chocolate are perfect together. And I just happen to have over-ripe bananas that need to be baked into something! Thanks for the recipe! As for your blogging subjects – yes you set out to blog about how to use a farm share, but isn't part of your story how you fill in the "holes" the farm share leaves, or how it affects the rest of your shopping? I like hearing you still appreciate sales on produce at the grocery store, and that you still buy tropical fruit and other produce not available in your farm share. It is all part of your story and absolutely belongs in the blog! Thank you so much for your words--you are absolutely right, and I needed to read this. Genius. Now what the heck is the red ingredient? And your Hubby's photo is amazing. I had no idea what bananas on the tree looked like so thank him for enlightening me. It is much appreciated. By now you know it's wild violet syrup, though I won't be putting them up on the blog until next April so it's more fresh in mind before violet season. Like I'm sitting on the most amazing green tomato jam until Fall, when (at least for me) red tomatoes are less desirable than they are in June. But these muffins? Yum. Hope you try them. I love the combination of banana and chocolate. It's magical... even for breakfast. You are correct! Though I am in the mood for the magical combination of smoked salmon and capers and red onion and cream cheese and an everything bagel for breakfast. I wonder how long I can stretch out the Mother's Day celebrations? Bananas and dark chocolate... what a great combination! These sound wonderful, thanks for posting! Now I want to add a caramel drizzle, but that's because I have Samoa Poke Cake on my brain. Please let me know if you try them. These muffins sound awesome! And I love how easy whole bananas are to freeze - I had no idea you could freeze 'em like that. Brilliant! If you're ever staring at ripe bananas and your new babe is keeping you from using them--don't worry and don't throw them away. Just toss them in the fridge and you're good to go. Have you seen The Naptime Chef? You can do all sorts of things while your little one is sleeping! (Though you really ought to rest yourself as you need it--cleaning definitely can wait). These look lovely and really easy, Kirsten. I'm going to start pinning your recipes to my Pinterest because they all look so good! Thanks for sharing at From the Farm Blog Hop! Muffins are usually pretty easy to me, especially since everything here can come out of my freezer or pantry. Biscuits are one of my Everests! Love the banana picture. I wish that we had a CSA here but we don't. Your muffins look wonderful. Thanks for sharing on Foodie Friends Friday. Is it weird that I hopped on localharvest.org looking for CSAs even before we started looking at towns to live in when we were moving? Anything that gets more veggies into your kitchen is good in my book. Looks so delicious. The banana photo is really nice!~ Thank you for sharing with Foodie Friends Friday. Hope you come back this week! I'm so glad I've got a talented spouse and have lived in some interesting places, so I could rummage around in our photos to find that photo for this post. 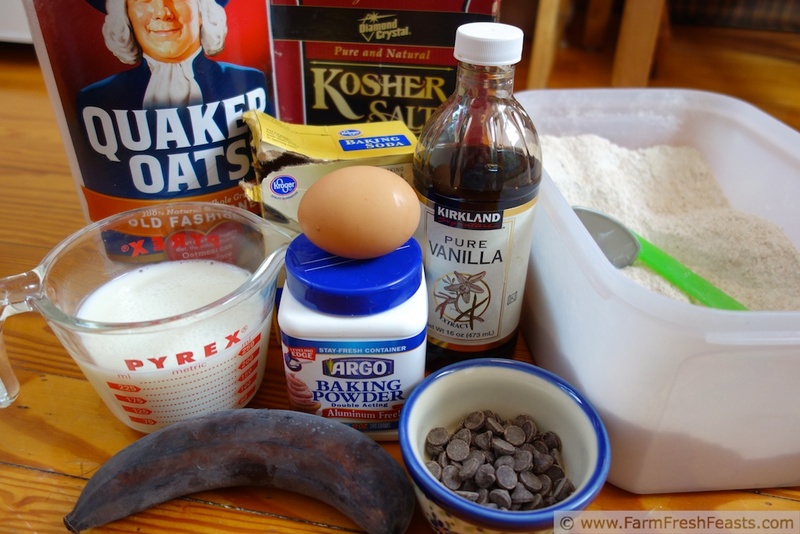 I have totally been craving a comforting and delicious banana recipe lately. This is going to hit the spot! With the moving you need comforting recipes I think.